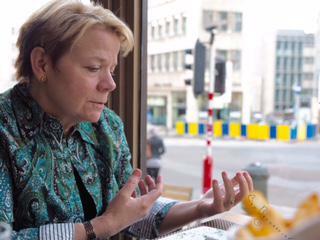 Marin Alsop brings an aura of calm and focus to a bustling brasserie in central Brussels as she turns her powerful intellect to the subject of: "Why would a globe-trotting conductor spend a week accompanying young hopefuls at the finals of the Queen Elisabeth Competition (violin 2015)?" Part and parcel of her commitment to music, in the widest sense of the word, are the significant number of programs she has created in her role as conductor of the Baltimore Symphony Orchestra: Pathway to Music; Meals and Mentorship; OrchKids and the Baltimore Symphony's Rusty Musicians venture, which encourages adults to join in with orchestral professionals. For over 25 years, she has found the ways and means to place California's Cabrillo Festival of Contemporary Music at the juncture of the adventurous and accessible. Indeed, Marin Alsop, feted world-wide as one of the premier conductors of her generation, is more apt to focus on "giving back" than on maestro-ly career moves. In prose that reminds one of her mentor Leonard Bernstein, Alsop mused, "To make a difference is of increasing importance in the here and now, where young people receive much of their information through social media. So many interpretations are accessible through YouTube. However, as inspirational as those received messages might be, a great deal more can be transmitted if those teachings are literally passed down, verbally, physically, by real example. By expressing what I have learned, I continue to reassess and grow as well. It's a two-way street, a highway of knowledge and exchanged ideas." Turning to the grueling finales week at the Queen Elisabeth International Music Competition 2015, in which the last 12 contestants vie for top six prizes in performances of a compulsory work coupled with a major concerto, Alsop places great importance on the compulsory composition (this year, Michael Jarrell's "aussi peu que les nudges"/"as ephemeral as the clouds") . "At the pinnacle of all competitions you would expect finely executed renditions of major concertos. The international group of contestants come from great schools and fine teachers and most of them will have benefited from superlative training. However, to shape the compulsory piece out of virtually thin air calls for true maturity and artistry. An intelligent musician will strive to bridge the initial gap between the technically demanding solo part and the orchestral voice. To master the vernacular of an unknown work in a week's time and bring a personal interpretation across to the audience is a great accomplishment that deserves the highest recognition." Experiencing Alsop in action night after night at the QEIMC enlivens her message: each young performer receives special treatment, undoubtedly enhanced by the maestro's inside experience as a fine violinist. To quote one of the finalists, "She helps us reach a comfort zone that I thought would be impossible to find on stage at a competition." Looking beyond the intensity of the QEIMC, Alsop expressed concern regarding the state of orchestras in both Europe and the United States. "Shrinking subsidies, budget cuts everywhere, instability in terms of basic job security issues creates a pessimistic picture for the future. All of us concerned with the future of the arts must maintain a vigilant attitude toward lowered standards. Happily, there are new markets opening up where classical music is supported and welcomed with open arms. My orchestra in Sao Paolo exemplifies this: a fantastic hall, growing audiences and a positive spirit infused with enthusiasm and joy." Alsop's sharing, caring and unwavering commitment to music resounds and triumphs. Could you fix your headline please? Alsop is a MaestrA! Aha, this sounds like it's worth a good long argument. Maestro or Maestra? I mean, we did ditch "Concertmistress" long ago, thank heaven. Thoughts? Maestra is correct. It may sound foreign but female conductors deserve this word along with brava (and not bravo).